I have a lot to write up, some of it even related to Jerez, but wanted to share some thoughts from tasting these five quite magnificent Chateau Neuf du Pape with David Martinez at el Mostrador de Vila Viniteca last night. 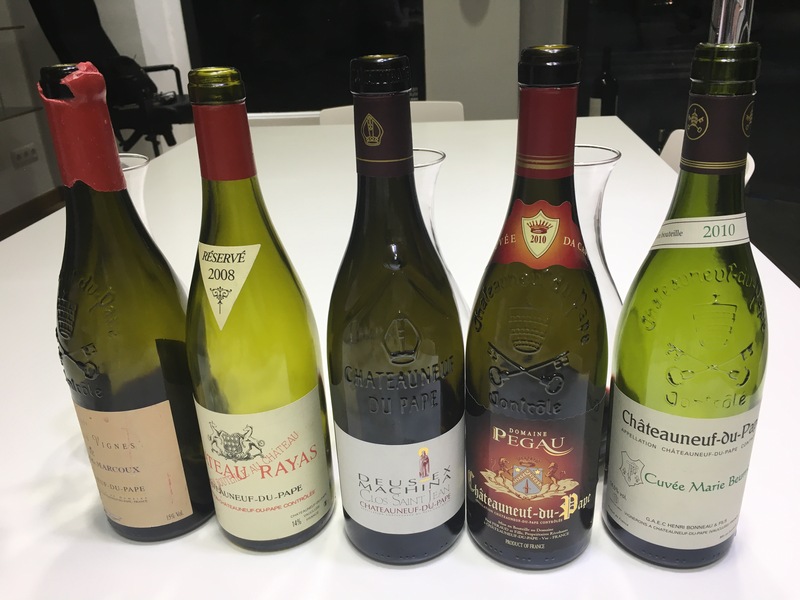 They were all at the very top level, but for me two stood out – the very first, Domaine de Marcoux Vielles Vignes 2009, which had a concentrated jammy fruit and liqueur that shouted out Chateauneuf; and the second, the amazing Chateau Rayas 2008, which had aromatics and a kind of ethereal strength that could only be, well, Chateau Rayas, which famously has cool terroir soil in a hot place. Talk about wines with personality. I am not saying that this level of expression is possible in Jerez, but surely we ought to be at least trying? Was very fortunate to take part in an absolutely top class event organized by Vila Viniteca here in Madrid this weekend – The 10th Premio de Cata por Parejas (Tasting in Pairs competition). 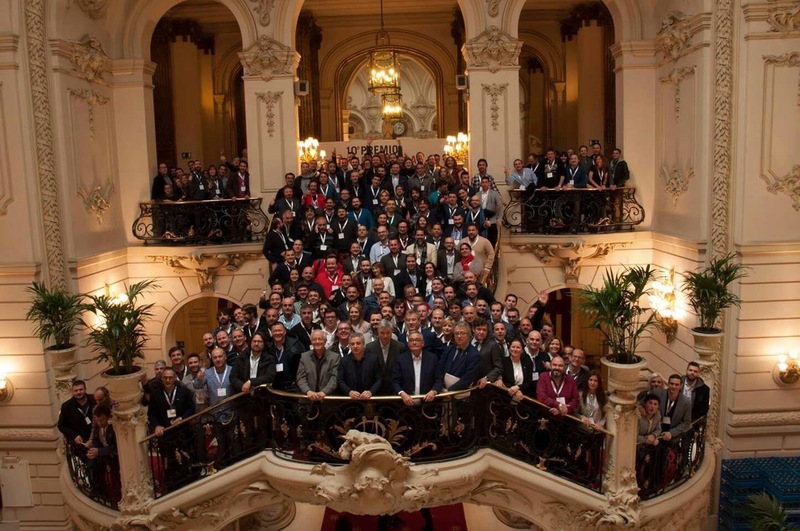 I was blown away by the scale of it – 120 pairs of contestants in the contest itself but on top of that 50 top drawer bodegas showing off their wines to around 2,500 people in total, and all in the stunning surroundings of Madrid’s original Casino (not currently a casino, confusingly). If you don’t believe me you can see some TV highlights from three of Spain’s national broadcasters and Madrid’ local news (all in Spanish and untainted by my presence) here, here, here and here. And it was enjoyable for a lot of other reasons. First, my “pair” was Ana, formerly of the Chula de Chamberi and we spent most of the 90 minutes laughing, teasing and generally enjoying ourselves. Second, there were an awful lot of good friends and big names around the room and the place generally – it was a pleasure to compete against and chat to Jesus Barquin, no less. Third, the wines downstairs were as good as those upstairs – the new Riberas from Dominio del Aguila and the classic Riojas by Finca Allende stood out for me, and Jerez was fantastically represented by Lustau and all their almacenistas, but there was top drawer liquid everywhere to be honest. But most importantly I have discovered I really enjoy tasting wines blind. Not because I am any good at identifying them (although I was pleased with the effort on the day) but because it strikes me that you focus on and enjoy the wine that little bit more. On the day itself they were top wines, but in the last few weeks people like David at Angelita, David at Era and David at Santceloni (different people) have been trying me out and wines I previously thought I didn’t like were surprisingly enjoyable. In fact I reckon that from now on I am going to tell sommeliers I am training for next year. So a great day, and bravo both to Vila Viniteca for an outstanding event, and to the winners – Luis Gutierrez and Ignacio Villalgordo – winning this thing for the second time no less. A brilliant performance from them and the other podium dwellers and I clearly need to drink a lot more Salon in future. One of those lunches that was highly enjoyable, alcoholic, and sobering. Coming face to face with the wide world of wine and not meeting many sherries. Wonderful place this – and the world of sherry needs to do more to be here. 67 Pall Mall is a (the) private members club in a (the) prime location in London: if the window was open a practised arm could lob an empty wine bottle into the garden at St James’ palace. It is an absolutely top class neighbourhood – I won’t go through the full list of local establishments but suffice to say that it is just down the hill from Economist Towers and around the corner from Lock’s hatters. More importantly once you get inside you have the world of wine at your feet. The wines displayed above represent only about 75% of the wine list (if you include the stuff on the lower level that you can’t see). Literally hundreds of bottles, and even more impressively they have an outstanding range of wines by the glass. I was unable to count them because the list comes on an ipad, complete with short cuts, and I am hopeless at counting and scrolling. Our lunch was based around the wines of burgundy and there was a frankly stunning selection of St Aubin, Corton Charlemagne, Meursault, and Volnay by the glass, so just imagine the possibilities if you choose to range more widely. There was also the definition of expert guidance on hand: a top team of sommeliers lead by top man and madrileño Roberto Duran – a top bloke and one of the very few to have passed the Advanced exam of the Court of Master Sommeliers. And the sherry presence? 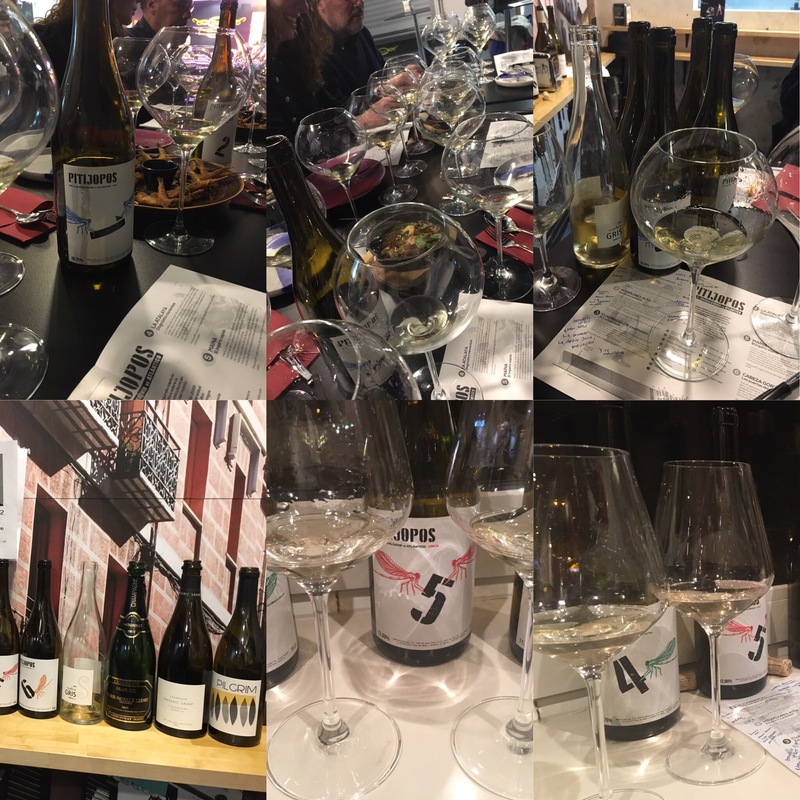 I must admit I didn’t study in much detail but it was good alright – some very solid wines from Equipo Navazos, Tradición and Hidalgo la Gitana by the glass, probably a few more by the bottle. 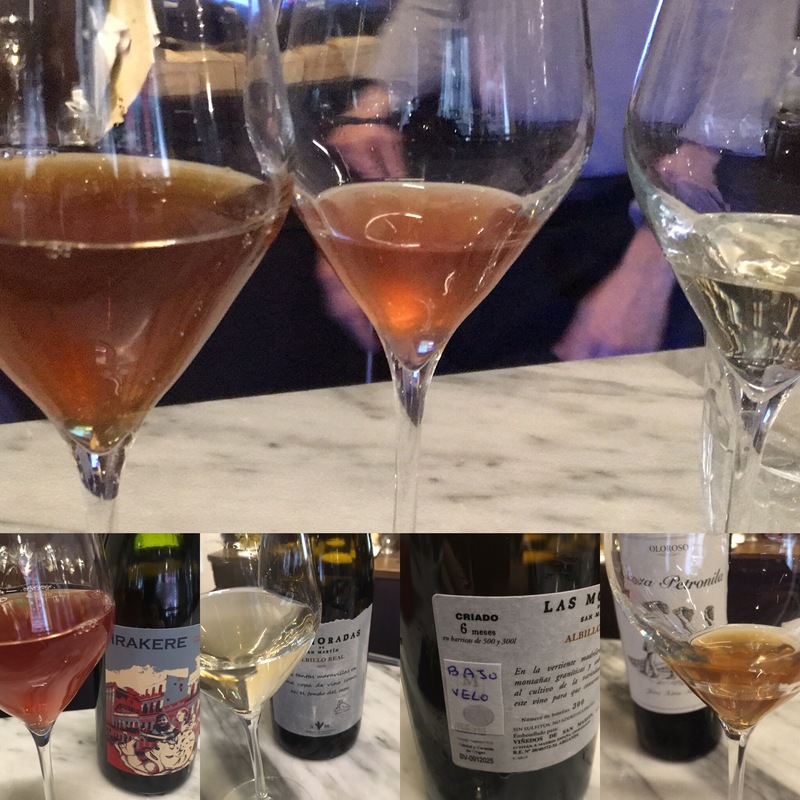 But it was another of these occasions where I was struck by how much the wines of Jerez and Sanlucar lose by not paying more attention to terroir and vintage. The sherries there were good alright, but some of the burgundies and clarets, and indeed many others, cost more by the glass than the finest sherries did by the bottle. Now I may spend my life swigging down sherries, and have got through a ridiculous number in the last couple of yeards, but even I was just struck by how many more possibilities there were elsewhere on the list: there were multiple vintages of some wines by the glass, for a start. But those are really just symptoms of a broader issue. The wines on this list reflect, to an extent, the tastes of the members of this club, and whatever else is true that is a group of highly sophisticated wine lovers. The fact that there were relatively few sherries suggests to me that for all their quality and qualities, the wines of Jerez and Sanlucar have a bit more to do if they are to get back to the place they deserve.